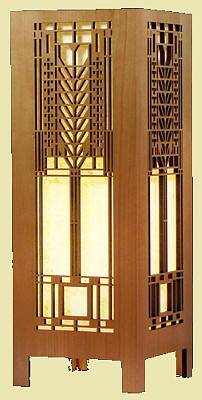 Frank Lloyd Wright (1867-1959) is widely considered to be America’s greatest Architect. Adapted from Mr. Wright’s original designs, the Frank Lloyd Wright Collection® Wood Lightboxes are well-crafted medium size table lamps. These Wood Lightboxes are a wonderful home accessory that can dress up any table, mantle or hall console. The Lightboxes are laser cut from 1/4" Cherry veneer wood and are 15 1/2" high and 6" square. Because each Lightbox is made from real wood, color and grain will have an attractive variation piece to piece. The Lightbox includes a 10 watt compact fluorescent bulb and an in-line cord switch. Manufactured in California USA, please allow 2 - 3 weeks for shipment.